I'm printing of the first pre production run today so it will be fitted/trialed and tweaked if necessary. be good to still get you feed back! very good, I will be interested in this. Defo interested! Looks ace! BTW would an iPhone 6 Plus fit? the iPhone 6 plus is 77.8mm wide so it would not fit thro' the top of the ashtray! as thats only 70mm. but I could make the dock accept the iPhone 6 plus by making the recess a little wider if people wanted to leave the top off the ashtray! probably wont look as nice but I could make these on demand if needed. Yes because you can use the previous/next track selection that sits at the top of the screen when you press the on off button! ok, quick update on progress! I have had to modify the design a bit as the the reproduction ashtray from VW Heritage seems to have a slighty different hinge pivot point making the lid hit the dock . I have now added a relief at the back of the dock to accomodate a good to clearance for this and other reproduction makes! The new design is printing tonight as a final check, then should all be good to go. Attached is a link to photos of the dock now with adjustable/removable Iphone support and I have also added a clearance hole for a 3.5mm jack socket for those who do not have bluetooth capabilty on the stereo. I was going to sell the item as a bare unit so you would need to provide your own Iphone charge cable but I could maybe supply the lightning cable as well? 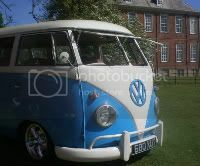 I'm aiming to have enough to take to Alive & V-Dubbin at Jimmys farm Sunday 14th June! first batch of iPhone 5 & 6 docks now ready! those who have already been in touch I'll PM you tomorrow/Monday. what price are they and does it include postage? Just putting this up for everyone who has been in touch for an Iphone dock. I had another slight delay due to the fact I found there were so many variations of 3.5mm aux. cable jack socket outer diameters on the connector! So i have therefore decided it was far better for me to supply the dock with this 3.5mm aux. cable to ensure perferct fit and alignment. these have been ordered and due for delivery tomorrow. I will also have one complete dock with ashtray and leads (its rat look though or you can paint it) this is left over from all my trials of designing/fitting but is totally complet and correct ready to drop in the dash! I will put some pictures of this up. Soooo close now, thanks for you patients! Picture below show the parts now included in the kit! Rather than use the headphone jack for audio could you just use one of these? Looks a great piece of kit.